I am Craig Jones the owner and manager of Alabama Lawns, Inc. I am involved in every daily aspect of the business from meeting customers, spraying weeds, commending my employees or sweeping the shop floors. You can find me doing it all. I have 30 years invested in pleasing customers. You can always count on my best efforts. We put together a staff that is incomparable to any other company in Montgomery area. Our staff has over 120 combined years’ experience. Most employees have over 10 years. That is hard to find anywhere. For your next lawn fertilization or weed control give Craig a call!! Contact us today for more information. 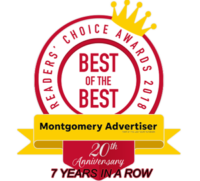 Alabama Lawn voted #1 in the Montgomery Advertiser’s Reader’s Choice Awards 7 years in a row.